I loved Hong Kong. It reminded me a bit of a cross between New York City and San Francisco, in Asia. My “weekend” in Hong Kong was actually parts of two weekends but it makes up a Friday night through Monday morning, on both Hong Kong Island and Kowloon, in the humid sunshine and cooler rain, so I feel like I got a wide range of experiences in. I arrived midday on a Sunday and was staying in Kowloon. My hotel was close to the harbor and Nathan Rd., so it was easy to wander around for awhile snapping photos and taking it all in. Shop – I didn’t fly halfway around the world to go to the mall, but if that’s what you want to do you don’t have to travel too far to find one! I ended up eating lunch in a mall one day and that was enough for me. 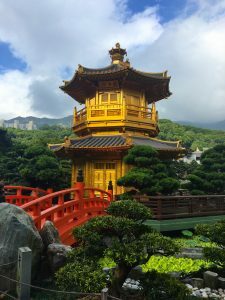 Nan Lian Garden – a bit farther away, but completely free and while a little crowded, it was peaceful. It appeared that you could have tea there, but I just wandered around and took in the pretty sights. Temple Street Night Market – I didn’t end up making it here and I’m not sure if I’m disappointed about that or not. If you haven’t been to a lot of markets and bazaars I’m sure it’s worth going to – but I didn’t really feel the need to haggle over DVDs and things I just didn’t need. Lan Kwai Fong – if you find yourself on Hong Kong Island (or hop on the ferry or train and head over) this area is full of bars and people drinking on the streets. We had fun wandering around and people-watching until 3am (when we got tired, but it didn’t seem like anything was dying down yet). 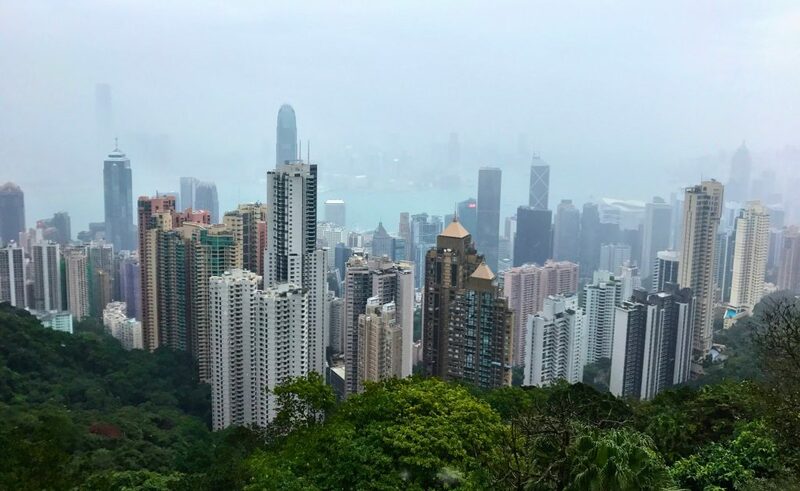 Victoria Peak – unfortunately, the day we planned to do this started out a bit foggy with drizzle. We waited until things appeared to be clearing up and halfway up to the peak it started raining. And raining. And raining. How we even managed to get a picture this good is beyond me. If I go back to Hong Kong (which I hope I do one day!) I’d like to go up at night, and maybe again during the day if it’s sunny! Tip: if the line for the tram is long, take a taxi – it’ll be a similar price and you won’t be waiting in line. However, the lines to leave were tremendously long. I’m not sure if this was due to the weather, but we ended paying surcharges to get an Uber back to our hotel – well worth it since we were tired and it was cold and dreary out. 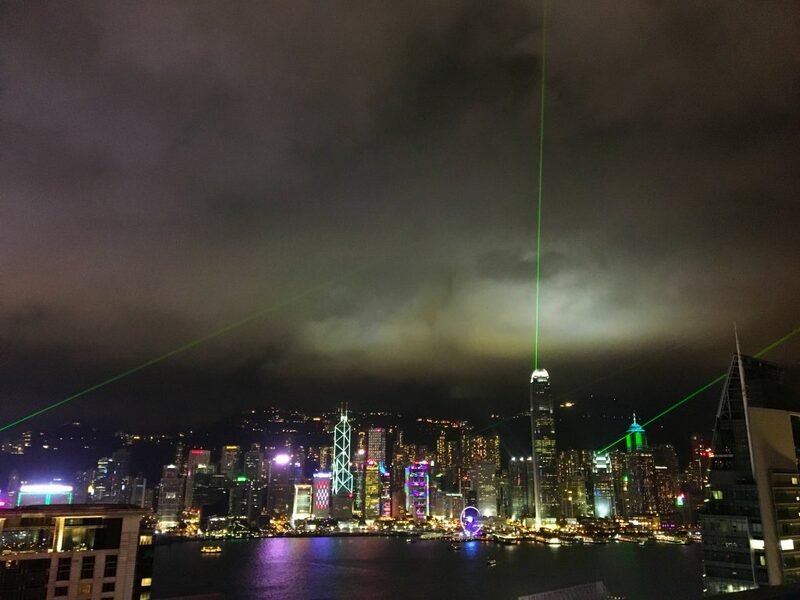 The Light Show – at 8pm every night you’ll see a light show from Kowloon. I was up on a rooftop bar so I had a great view, but apparently, there is also music you can hear if you are closer to the harbor. Star Ferry – ridiculously cheap and why not? We took the ferry from Hong Kong to Kowloon one morning, but I’m sure taking it at night during the light show would be great. Tim Wan Ho – Three words. BBQ Pork Buns. Yes, this is the cheapest Michelin star restaurant in the world. Yes, it is a chain. Yes, it is as good as people say. The two of us spent less than $20 on lunch, ordered more than we meant to, and enjoyed every single bite. Get the BBQ Pork Buns, perhaps two orders (and when the menu says “bun” understand that means three will come in your order. Din Tai Fung – another chain that you can even find in the United States, but we don’t have one in San Diego and I had never been. There was one around the corner from my hotel in Kowloon so I grabbed a quick lunch there (across from a Ruby Tuesday in a mall). Kin’s Kitchen – described as upscale Cantonese, we found ourselves feeling like some of the only tourists in the restaurant on a Saturday night (making us feel that we had made the right choice). We had one of their signature dishes, the smoked half chicken, which was delicious (and appears that the chicken has been cut right down the middle – head and all), some BBQ pork (no bun here) and some fried rice. Everything was delicious. Budaoweng Hot Pot Cuisine – this was my first hot pot experience and my waitress was really helpful with showing me what to do and helped me make a sauce. I’d definitely recommend checking this place out and the more people the merrier! It’s also on a high floor in the Tsim Sha Tsui neighborhood so if you sit near a window you’ll have great views of Hong Kong Island. Afterward head even higher up to Eye Bar which has indoor and outdoor seating. Due to the fact that our “weekend” in Hong Kong was spread over two weekends, we opted to spend the first part on the Kowloon side of the harbor and the second part on the Hong Kong side. Hotel Pravo – located in the Tsim Sha Tsui area of Kowloon, this hotel was close to the harbor, Nathan Road, and the MTR, making it easy to get around. The hotel itself was rather dark, but the bedroom was a decent size with a couch and the bathroom was nice. For the price and location, I’d stay there again. Metropark Hotel Wanchai – I think they may be very soon changing the name of this hotel to Kew Green. The hotel was in a decent location on Hong Kong Island in the Wan Chai neighborhood, a close ride to Central, to get to the Peak or the ferry. The room smelled of stale smoke, though, so if possible I’d request a non-smoking room or floor.